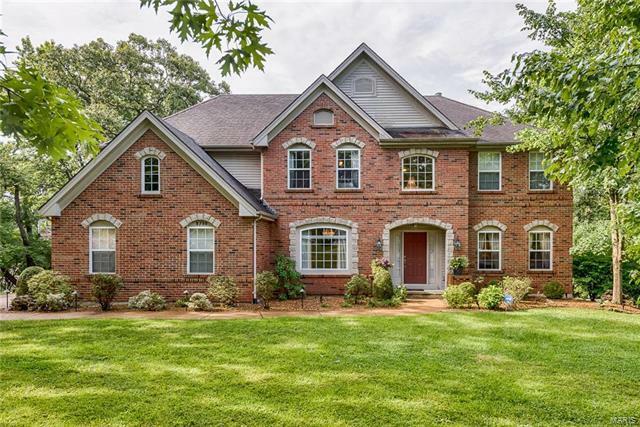 Stately 2-Story w/over 5,500sf of comfortable living space w/4 bedrooms, 4.5 baths, 3 car garage & a finished, walk out lower level. Attractive exterior w/brick & stone facade, professional landscaping & exquisite night lighting. 2-story entry foyer w/gorgeous chandelier & hardwood floors greet you upon entering along w/a library & dining room. Enjoy the sun-drenched great room w/soaring ceilings, gas fireplace & a wall of windows. Just off the great room is the generous sized kitchen featuring a cooking island, 42" cabinets, Jenn-Air appliances, granite counters, pantry & spacious mud room. The hearth room is open to the kitchen and boasts a gas fireplace & access to the back deck. Upstairs are 4 generous sized bedrooms including the master suite w/a walk-in closet & a large bathroom w/soaking tub, dual sinks. The lower level is perfect for entertaining with a wet bar, large media room with built-in speakers & ample light in the rec room. Olive Blvd just East of Old Bonhomme Road, South on Newcastle Drive, Left on Fairgreen Drive.